Panko and Parmesan Broccoli is an easy, cheesy broccoli side dish. Healthy, quick, and perfect for busy weeknights. I have another quick and easy vegetable side dish for you today. Like I mentioned in my No-fail Butter and Garlic Green Beans post, I have some strict requirements when it comes to the veggie sides that I cook regularly. They have to be easy. They have to be quick. And they have to taste good while still being healthy. Long, complicated, heavy sides are fine for the weekend, but on busy weeknights, I know myself well enough to know that I’ll just skip my veggies if it takes too much work to make them. And while mayonnaise-laden pasta salads and things like Loaded Baked Potato Salads are everything good and beautiful in this world, I shouldn’t be eating them every night of the week. This broccoli fits all three of those bills. It’sSO easy–if you buy pre-cut broccoli florets, you don’t even have to cut anything. It’s fast, and it’s so, so yummy. I’m not kidding, if you are making this dish with other people in the kitchen, you have to watch closely to make sure they are not stealing bites of it! 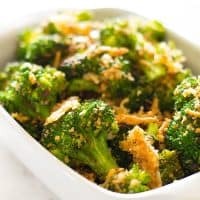 The broccoli is tossed with a little olive oil then sprinkled with panko, Parmesan, Italian spices and garlic before going into the oven for 10 minutes. 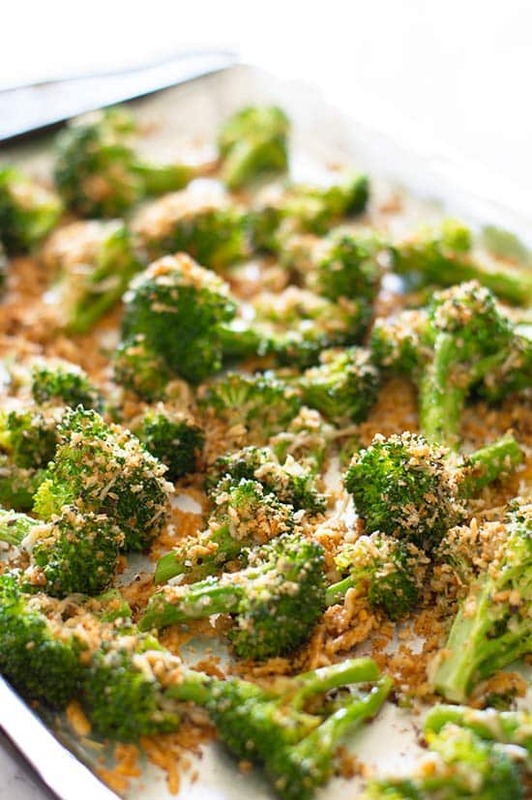 When it comes out, your broccoli is perfectly cooked and coated in a crunchy, cheesy coating that everyone will love. 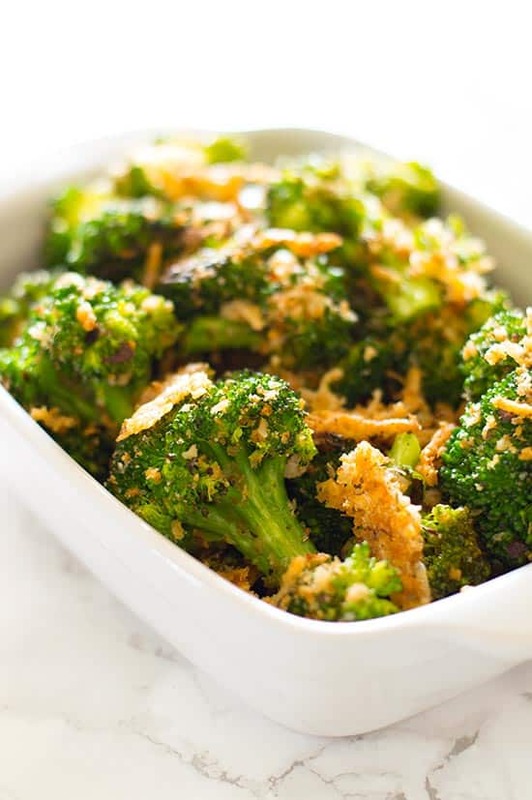 An easy, cheesy broccoli side dish with crunchy panko and Parmesan. Healthy, quick, and perfect for busy weeknights. Preheat your oven to 425°F. Cover a baking sheet with foil and grease well with cooking spray. 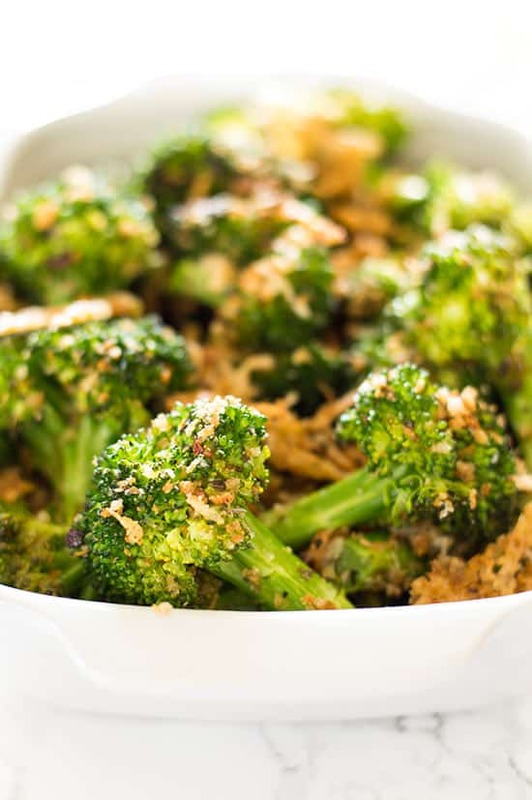 In a large bowl, stir together broccoli and olive oil, coating the broccoli as well as possible. Spread broccoli evenly over the prepared baking sheet. In a small bowl, mix Parmesan, panko, garlic powder, Italian seasoning, salt, and optional red pepper flakes. Sprinkle mixture evenly over the top of the broccoli. Bake for 10-12 minutes, until broccoli is tender. *For crunchier panko, you can toast it like I did here. Spray a frying pan with a little cooking spray and let the panko brown, stirring occasionally until toasted. I like my broccoli with a bit of a bite to it, so I cut large florets. If you prefer more tender broccoli, you can cut yours into smaller, bite-sized pieces. And if you have kids who will only eat their broccoli soft (I was one of those!! ), you can parboil it before roasting. Small-yield Instructions: 1/2 of a quarter cup is 2 tablespoons and 1/2 tablespoon is equal to 1 1/2 teaspoons. No prep or cooking changes are necessary. Make-ahead Instructions: Broccoli can be cut up to two days in advance and stored in an air-tight container in the fridge. Make sure your broccoli is completely dry before storing.